Douglas Chapel was a curious place, with 6 rough-hewn, wooden pillars supporting the roof. It was pulled down in 1875 when the new church was built on Parbold Hill.There was also an inn here, run by the Southport Brewery Company. This was located in the right hand part of the main old farmhouse, which shows several phases of extension. A hundred years ago, the vestry meeting (forerunner of the parish council) met in the inn. A Sunday school was held in the building next to the canal, which has now been converted to residential use and called "The Old School House". In the field south of the chapel, a patch of nettles marks the site of an old lock on the Douglas Navigation. Parbold Pottery The north side of the canal marks the site of Parbold Pottery, which was operating about 1800. Clay was obtained locally, and was said to produce high quality stoneware. There were two kilns. The pottery worked shifts, and some of the workers came from Gillibrands, at the east end of Wood Lane. The pottery closed about 1815. Parbold Bottle So called because of its shape, Parbold Bottle is a monument to the Great Reform Act of 1832, which extended the right to vote. 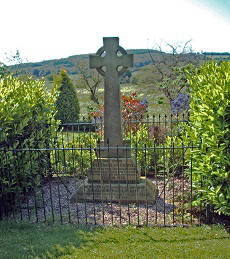 Just why the limited extension of the franchise warranted a monument in Parbold is not clear. 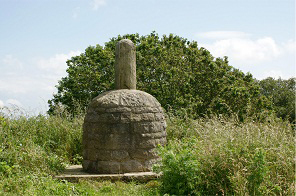 Originally the monument was much bigger, with a large building-like structure, with the small bottle sitting on the top, and was a landmark from the railway. Falling into a ruinous state, the bottle alone was repaired in the 1950's. To reach the bottle, walk about 200 yards downhill, west of summit of the main road over Parbold Hill, where there is an entrance on the left, follow the footpath away from the road for about 50 yards, until the bottle is reached. There is a fine viewpoint from here.